Like comrade Sula, whose review of Bucktown's new Izakaya Mita went live last week, I've long had an interest in the idea of the izakaya, the Japanese bar with a menu of compatible drinking foods, though my divergent experiences often left me confused about what izakaya fare typically was. So when Momotaro's main floor opened in October, I was eager to hear what reviewers would think of the food at its downstairs izakaya with a separate kitchen, set to open a week or two later. 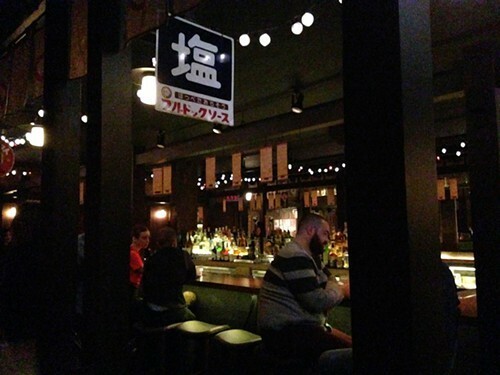 I understood this once I went last week—the Izakaya at Momotaro really isn't a separate restaurant of its own. Maybe it was when it opened, and your only choices were its relatively short menu of drinking-snack items, but we were told up front that we could order anything we wanted from the voluminous upstairs menu as well. Nevertheless, it is a different experience from the vast, chic space upstairs, decorated in simple black wood and dominated by a U-shaped bar against a mirror that makes the space look twice as big as it is. Standard pop music plays overhead—I'd have gone for an Asian take on vintage rock, like in the nightspot in Kill Bill: Vol. 1, but, hey, it's not my $5 million build out. They no doubt need to get the usual after-work Loop crowd, and not four hipsters quoting Jackie Brown to each other. So it kind of has the atmosphere but doesn't quite sweep you away mentally to Ginza. And the drink list, somewhat surprisingly, doesn't seem to do it either. Both of the cocktails I tried were too sweet—and how does a drink with bourbon in it, the promising-sounding Curious Tiger, wind up as pink as a Cosmo? But I guess you should be drinking beer or whiskey anyway; there's only two draft beers, one of them from Japan, but there's a list of a dozen Japanese whiskeys of which I know nothing because, well, who can know everything? Airbread, which is to say a puffed cracker topped with tuna and little bits of acidic Meyer lemon, is as indulgently lush as anything full of hot, gooey mayo could be. Uni on toast is maybe a bit overdressed with paprika or something, but it still highlights the sea urchin's alien texture and cold-water sweetness beautifully. The grilled items, cooked over binchotan on the robata grills visible in the kitchen window upstairs, are all impressively executed—chicken hearts that are like a cross between chicken and pork or beef, funky-sweet head-on shrimp, and deep-flavored ground short rib formed onto sticks were models of their kind. And then there was our final dish, called "sizzling clams," available only downstairs. It looked like the dish you often get in Chicago restaurants of clams or mussels in a broth giving off a slight lemongrass aroma. And it was that, but a really terrific example of that, complex yet light and nimble with bright Asian flavors, and accompanied by hearty bricks of garlic bread for soaking it up. The bread itself deserves mention, too; I don't know who makes it or by what recipe, but if it turned out that some spare pork lard from some other part of the restaurant made its way into it, giving it that scratchy texture and subliminal meatiness like Roman pizza bread, well, I wouldn't be shocked. Or I could have just been in a really good mood after the clams, and giving the bread extra virtues out of sheer gratitude. One other note: the service. It started out a little prescripted, but soon proved flexible with our demands and clunking attempts at being funny customers, and whether it was our server or a cook delivering our food, the service remained attentive, smart and seemingly excited to share what they do with us. 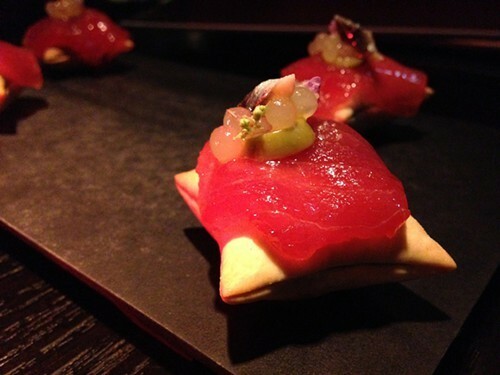 Boka Group's level of service seemed to take a leap up with the reconcepted Boka last year, and the conscientiousness and warmth of the service in this bar would have done credit to plenty of restaurants in Chicago. At least until the Crazy 88s showed up, swords in hand, Japanese surf music on the soundtrack. Finally someone does it right. Boka Group's Momotaro is going to bring a lot of Japanese dining to Chicago. "She likes them, I don't." Once infamous for its excesses, the influential restaurant from mercurial chef Michael Carlson has transformed into a fertile proving ground for Chicago’s next generation of young culinary talent. Now that it’s all grown up, has Schwa lost its edge?